Welcome to a new series on the blog, Currently Coveting! Highlighting recent finds from my Coveting Pinterest board, I'll show three of my favorite finds for the week. This J. Crew Factory tee is high on my list, especially after a rave review from Caitlin. I already have my bases covered in the classic stripe hues, but this olive green color would be a great addition to my wardrobe. I love olive in in-between weather and there's nothing better than a striped tee... so I might have to pick this up this week. These flats from Boden have been on my wish list for weeks-- aren't they perfect? 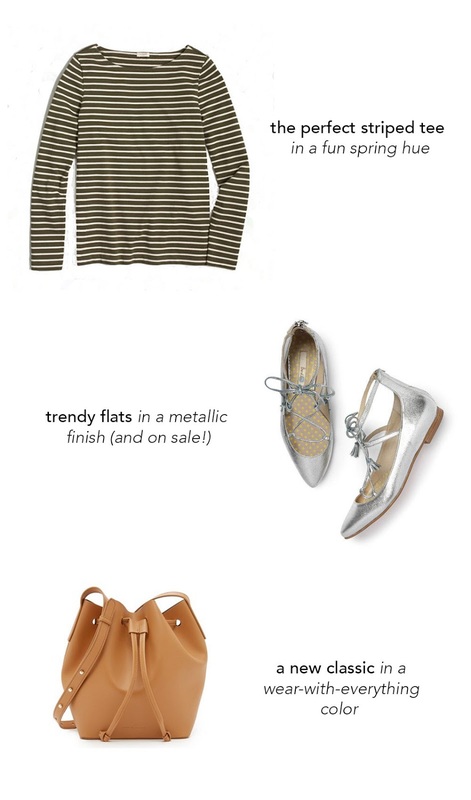 I've been loving the lace up flats trend (I have three pairs! ), so another great pair in a fun metallic finish would be a perfect fit. Plus, they're on sale for just about $40-- but sizes are going fast! Lastly, this bag is just amazing. After crossing my previous designer bag craving off my list last week (post on that to come! ), I've already set my sights on a new lust-worthy piece: this chic bucket bag from Rachael Ruddick. I tried out the bucket shape this summer when I snagged one during the Nordstrom Anniversary Sale and immediately fell in love. The structure is perfect for throwing your whole life into it while still looking polished. I'm in desperate need of an upgrade now and this beautiful leather version is pretty spot-on. Swoon.